Waste is something we generally try to reduce, avoid, and dispose of properly. However, medical waste has the added risk of exposing doctors, waste handlers, and patients if poorly managed. In addition to the infection, injury, and toxic effect threat, unregulated disposal of health care waste also comes with the risk of polluting the environment. So, where does medical waste go after collection? And what are some of the hazardous waste facts you should know? To avoid the aforementioned risks, it is vital for medical staff to separate all biohazardous waste materials at the point of generation. Then, the designated staff should treat and dispose of it safely and appropriately. Today we will look at some of the facts and risks associated with getting rid of biohazardous waste in an incorrect way. Health care waste is a subcategory of wastes produced in medical facilities, including hospitals, dental practices, physicians’ offices, blood banks, and veterinary clinics. The term also covers the biohazardous waste generated in medical research laboratories. In general, medical waste refers to medical items that may come in contact with body fluids, blood, and other potentially contaminated materials. These are some examples of medical waste, but the term can cover more materials than the ones we mentioned. Each year, hospitals and other health care facilities generate about 2 million tons of medical wastes. Firms that mass-produce pharmaceuticals are among the largest generators of this waste. But once it is collected, where does medical waste go? Many people involved in the medical system may suffer by the improper administration of discarded waste, including sharps and contaminated materials. For instance, used needles which are disposed of inadequately may cause stick injuries to waste workers and lead to infection should the containers rip open inside garbage trucks. The same scenario may occur if hospitals mistakenly send needles to recycling facilities. Meanwhile, housekeepers and janitors are also exposed to the risk of injury if loose needles jab through plastic garbage bags. And the risk of being poked with a discarded needle may involve serious illnesses, including hepatitis and human immunodeficiency virus (HIV). Read on to find out some of the common methods of disposing of medical waste and which are the most efficient. In 1988, the U.S. Congress authorized the Medical Waste Tracking Act to conduct studies analyzing and assessing proper ways to dispose of medical waste. During the MWTA, one of the studies reported that sharps waste (needles and such) represent the greatest amount of medical wastes, closely followed by body fluids and blood. Incineration. The Environmental Protection Agency reports about 90 percent of biohazardous waste continues to end up in incineration facilities. Whether on-site or off-site, incineration should only take place by licensed contractors. Incineration is so prevalent because it sterilizes, reduces waste volume, and gets rid of the need to pre-process the waste before treatment. Post-incineration, waste is transported to a sanitary landfill. Autoclaves. Also known as steam sterilization, autoclaving is the most reliable method of destructing any form of microbial life. A great percentage of the waste treated by shredding and steam sterilization is safe for the sanitary landfill. Other methods. We will mention here microwave treatments, chemical/mechanical disinfection, and irradiation. Health care facilities shouldn’t dispose of biohazardous waste on their own. Incorrect disposal can cause life-threatening diseases in waste handlers. Instead, only professional medical waste haulers should handle and collect biohazardous waste. In most states, monitoring agencies closely regulate medical waste disposal. Meanwhile, noncompliance with the law – which refers to improperly disposing of biohazardous waste – can result in harsh penalties and considerable financial consequences. About 85 percent of the total amount of waste produced by health care facilities is non-hazardous waste. However, the remaining 15 percent is classified as hazardous material, which means it is radioactive, toxic, or infectious. Approximately 16 billion injections are administered globally each year. Not all of the used syringes and needles end up in proper disposal facilities afterwards. 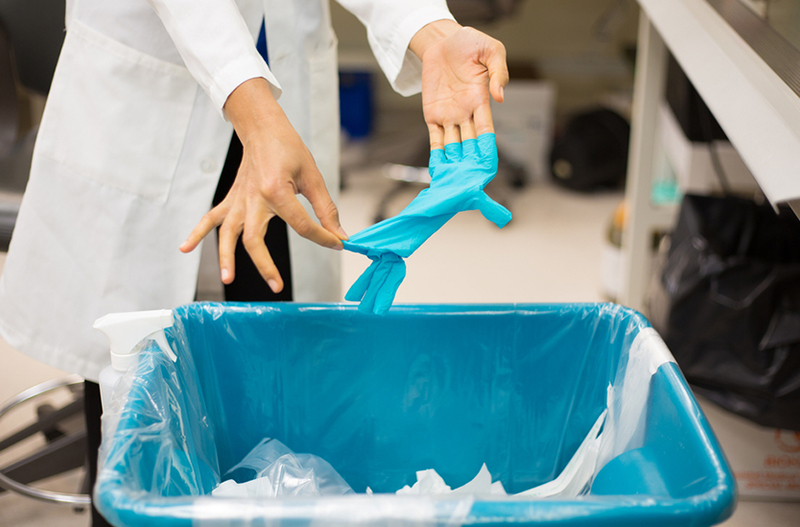 Health care waste contains microorganisms that are potentially harmful, which can contaminate medical staff, hospital patients, and the general public. When incinerated, medical waste produces furans, dioxins, and other air pollutants in the form of gas emissions. While there are national and state agencies handling regulation of medical waste, WHO has also developed a global guidance act on the matter. Titled “Safe management of wastes from health-care activities”, the document has already reached its second edition. It addresses various aspects of safe disposal of medical waste, including recycling and waste reduction, regulatory framework, storage and transportation, and treatment options. WHO’s intention is to train the medical and administration staff of hospitals and other health care institutions. The document is also a good guidance for members of the public health sector, policy makers, and executives of waste management companies. Hopefully, this guide explaining the nature of medical waste disposal has helped you find a more comprehensive answer to the question Where does medical waste go? Let us know if you have any other inquires on the matter in the comment section below.